Moms Little Run Away: No Rain? Yes I posted that yesterday as that was the weather report. Well shortly after I posted last night it started to rain. It rained all night and poured at times. When my daughter came for breakfast she put my truck in the street so the down pours would clean off the mess from all the dust and when it sprinkled leaving some really nasty messes all over the truck. After a couple hours she pulled it back in and wiped it all down, looks like it went to the car wash.
We had a great break breakfast this morning. 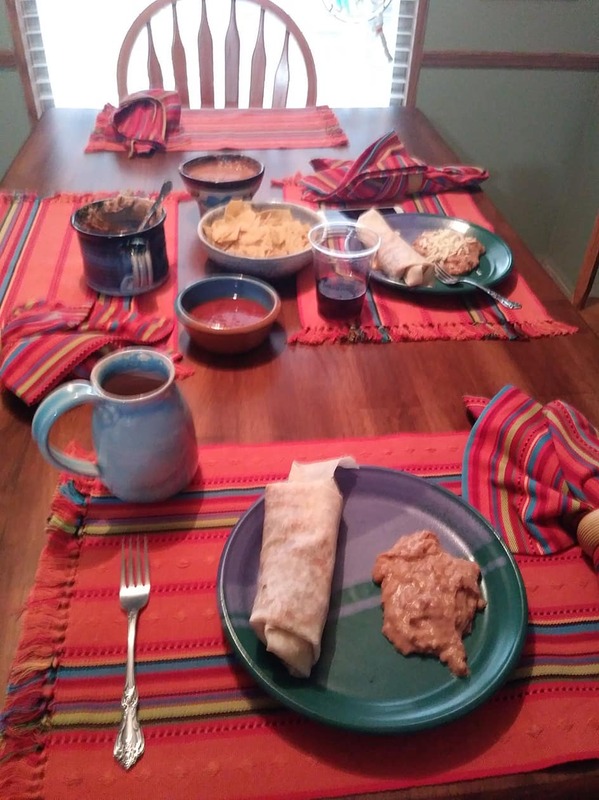 Made chorizo n egg burritos with refried beans, chips and home made bean dip. All left overs went home with Tracy. After breakfast Tracy had to leave to get her tire fixed as she was using a donut since last night. I don't understand why they would make such a crazy thing. I know they thought they saved space but to me they are not safe. I always bought a regular wheel and tire. A nice heavy rain sure does a nice job of cleaning you vehicles. Breakfast sounds and looks wonderful. Great breakfast and wonderful rain. Good start to your day. It was good thank you and we did have lots of rain for most of the day. Glad you finally had Rain and enjoyed Breakfast with your daughter. It has rained a little every day and some days it pours. My daughter and I spend every Sunday morning together its fun. I'm with you, Jo. If you have to go through the trouble of changing a tire, why not put a permanent one on and used the fixed tire or new tire as the spare? Seems like unnecessary work to me. Glad you got some rain. We had a downpour the other night--this whole spring/summer has been a wet one. The upside is that everything is green--the downside is mosquitoes! My car also go cleaner during the really heavy rain. I had wiped off the front of it after my trip to get rid of the bugs. She will buy one next week but did get the tire fixed right away and changed over. A free car wash! Good idea to eat at home eating out can add up. That's why I usually cook my own food when I travel it's just too high. Your table setting looks great! We are missing the rain now. Last week it was slightly flooded...this week just hot and dry! Here in East Texes (Just north of Houston) we usually get plenty of rain but there is none in the forecast for the next week or so. I had to smile when reading about your free car wash! I wish we'd get some rain around here, but will probably have to wait for winter to see that.